First off, everyone needs to know that I was the girl who LOVED school. I loved getting up in the morning, writing essays, studying until 3am and getting those marks back; all of it. I vowed to myself that I would get a job that gave me that very same feeling. That feeling of excitement, the feeling of knowing you were going to learn something new, be challenged, and feeling that every single day. Boy, did I find that at TribalScale. I started as TribalScale’s Marketing Manager 1 year ago today. I came in not knowing a single thing about technology, but I felt that all the roadblocks in my previous e-commerce, retail, and not-for-profit marketing roles had technological solutions. I was inspired. I was ready for the learning curve, but I was also terrified. 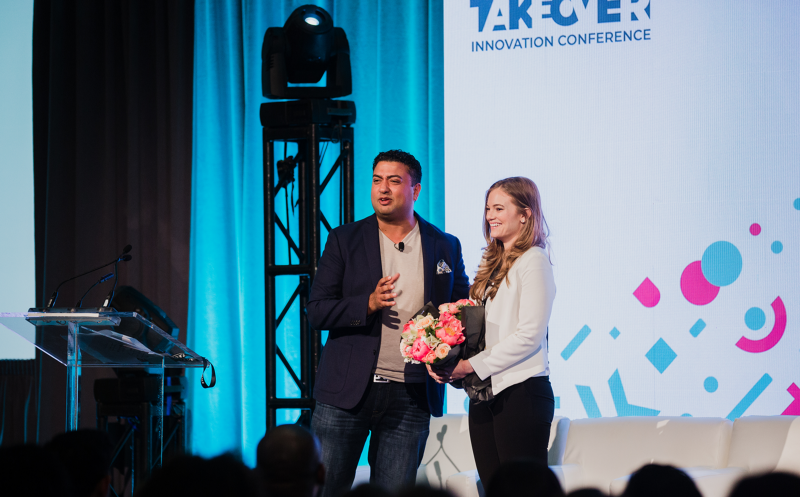 Two months later, I threw my first TakeOver Innovation Conference. Looking out at an 800-plus audience of global innovators, I knew this not-for-profit girl had somehow pulled it off. I knew I could do it. I was literally thrown into the fire and I came out on the other side. And this is just a taste of what has been accomplished in a year. Imagine what can happen in 90 days? A whole new office in the US with 11 new employees and 2 new service offerings? Yes it’s possible and it’s real at TribalScale. When I walked into TribalScale for my interview with Sheetal just over a year ago, I upfront told him that I knew nothing about tech. I was fully transparent and I admitted to my weaknesses — I believe that knowing your weaknesses and owning up to them is a strength. Sheetal and I immediately clicked over shared values, a willingness to learn, to push yourself, and live for the challenge. He took a chance on me and I’ve worked hard to prove myself. I proved my marketing chops in a whole new field, I hired the people that would fill my gaps — we’re stronger together — and I’ve totally adopted Sheetal’s vision for TribalScale as my own. It really comes down to taking the initiative, owning up to your strengths and your weaknesses, and believing in something bigger than yourself; that’s been Sheetal and our mission here at TribalScale. With this level of growth and scale, TribalScale is truly a rocketship. But being a rocketship means you have to look new and shiny. Too many startups and small businesses ignore the importance of marketing early on, but it’s so, so, so important. Brand awareness is half the battle and as our global presence was getting bigger and bigger it was time to give our brand a fresh face and voice. So get out there, go network, get comfortable with putting yourself in uncomfortable situations, get up on stage, and make sure you get a Twitter account. (Seriously, I can’t tell you how many speakers I secured for TakeOver with DM’s). We embarked on a 6 month rebrand project with OneMethod, where our entire leadership team came together and worked closely to unpack who we are, where we are now, and where we’re going. We each had to ask ourselves, and each other, some hard questions, but it’s through this sort of collaboration and effort that we as a company grow together. In the end, we solidified our market differentiation, TribalScale’s global identity, and we’re ready to launch. So stay tuned, and trust me, the new face of TribalScale is awesome! Recognize and appreciate those around you, give kudos, and support each other. This is key for long term growth and team success. Now, as I kick-off my 2nd year, TakeOver is about to get global and we’re hosting TakeOver in Dubai in November! With all the go-go-go and excitement happening around me, I’ve found that it’s more important than ever to be humble and empower down. After 6 months of hard work, I was promoted to Director of Marketing and now I recognize more than ever the value of empowering within and lifting your team. If you’re lucky enough to work for a company that values and empowers its employees as much as TribalScale does, you need to give that back. Recognize and appreciate those around you, give kudos, and support each other. This is key for long term growth and team success. As Director of Marketing for a global team, I have the good fortune to travel, meet incredible people, and learn at world renowned conferences. I’ll be at Web Summit this November in Lisbon, Portugal, and back at SXSW in March — let’s connect! In the past year, my network has expanded 10-fold with the most caring, intelligent, and inspiring mentors, friends, and colleagues. Like our amazing CEO, Sheetal, always says, “your network is your net worth.” I truly believe that the mindset of a relationship builder is key. Think long-term and invest in those around you, it will pay off… I promise. So, reflecting on all that’s happened for me and TribalScale in 1 year, I have to ask: how did I get so lucky? I can come up with a million answers and hypotheses. But in the end, it’s all about believing in your company’s vision. Trust that your executives — especially if they are Kirstine Stewart, Sheetal Jaitly, Roger Chabra, Josh Wilks, and Mitch Seguin — know what they are doing. Be excited when you wake up every morning, ask questions, be humble, and go do whatever you can to contribute and help that vision grow. 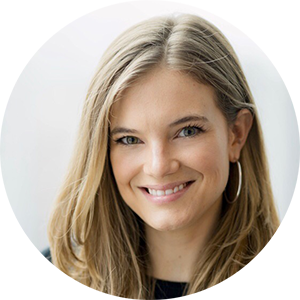 On my first day at TribalScale, I walked in as the 85th employee to a half-filled, 24,00 square foot office space on the 9th floor of a building in Toronto’s downtown core. It was so empty that we had a chair racing competition on my second day. As I mentioned, I knew nothing about tech — seriously, nothing. I spent my first week watching videos, reading every article I could, and I was completely silent absorbing it all (and for those who know me, you know how shocking that is). After attending at least 100 networking events, taking many late night calls with our OC office, having early Sunday morning work sessions with our team in Dubai, and with a community of innovators supporting and guiding me, I’m now walking into year two with an office so packed that people are standing around the kitchen island for some space. We’re a team that is 230 strong, the energy is undeniable and more infectious than the day before. I’m challenged, inspired, and I don’t remember what it feels like to be bored.